Google Analytics can be an invaluable tool when you are trying to optimize your website. However, it can be quite difficult for a newcomer to understand how to use it in the most effective manner. Creating and optimizing a website requires a lot of time, effort and, in most cases, money. Even so, you may find that your website is not registering the amount of conversions that you wished for. Even the flow of traffic can be low. 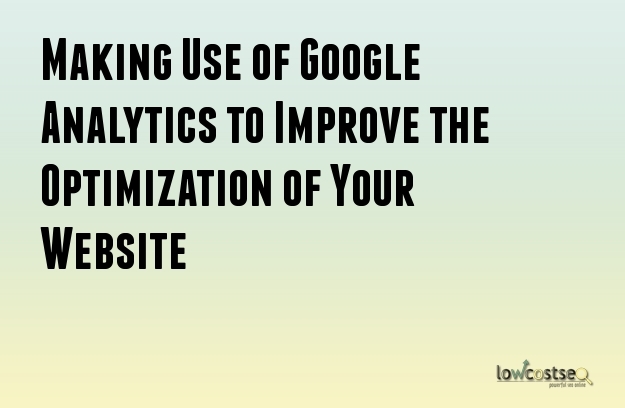 Through Google Analytics, it can be possible to make improvements. The fact is the majority of people are unable to make use of Google Analytics in the proper manner. Google Analytics can be used to gain data that can be acted upon. It is possible to use the data to increase the flow of traffic as well as improve the rate of conversions. The process of using Google Analytics to improve traffic is not a very difficult one. First, Google Webmaster Tools will have to be connected to Google Analytics. There is an option for SEO report inside Google Analytics. The SEO report will show you the rankings of all your keywords, the clicks as well as the impressions. You need to identify the keywords which have the most impressions. It is important to increase the click through rate for those particular keywords. The title tag should ideally be of 55 characters while the ideal length of meta descriptions is approximately 156 characters. The information provided in the content should match the intent of the keywords. These will be the keywords with the most impressions. The copy should always be created to be beneficial to the users. In other words, the users should find something of value to them when they use those keywords to land on your website. You need to remove any bottlenecks that exist with the help of Google Analytics in order to improve the conversion rate. This can be easily done through the users flow report available in Analytics. The report should be narrowed down by various filters such as traffic source, device or location. Highlight and check the traffic that is being directed to a particular conversion page. Perform an analysis on the mean drop off point as the users move from the landing page to the conversion. Once the weak point has been recognized, you can implement optimization methods to make improvements there. In page surveys should be setup at the weak points where most users drop off. Based on the results of the surveys, perform tests which can address the problems. A/B testing can help you choose the best option. All weak points should be similarly checked and optimized. Google Analytics can be a powerful tool if you manage to utilize it properly.